Typically, one of the first steps when planning a kitchen remodel is deciding on the kitchen layout. It is important to create enough space between walkways and high-traffic areas. In cooking zones, there should be 42 inches of space for a one-cook configuration and 48 inches for a two-cook configuration. Another important tip when choosing your kitchen layout is to be mindful of the location of your cabinetry, appliances, and how the two interact. You don’t want to open a cabinet door to find out that it bangs into an appliance, or another cabinet, and ending up with damaged materials. When planning the location of your appliances, try to avoid installing the cooktop in the island. It can be a hazard, especially for homeowners with kids. Additionally, it may be a good idea to have the refrigerator installed near the edge of the main cooking area (such as on the end of a row of cabinets). That way, the cook can easily access ingredients in the refrigerator, while a passer-by can also access the refrigerator for snacks or drinks without disrupting the cook. Account for lots of countertop space. Countertop space is essential for prepping food, storing small appliances, and setting down miscellaneous items. One area of the kitchen that should have countertop space on either side is the cooktop. The landing space around this area is priceless while cooking. Another area that would benefit by having extra countertop space would be the microwave. In a kitchen, there are many items that need to be stored away, which is why organization is a must-have. We recommend including some cabinet organization. Some good ideas for in-cabinet organization would be a knife drawer, a recycling bin, and racks for pots and pans. In addition, avoid weighing down the room with an overabundance of cabinetry by mixing up cabinet details. For example, you can replace a regular wall cabinet with a couple of open shelves to show off your prettiest glassware. However, if you still need as much cabinet space as possible, try including some glass panels in your cabinets to make the room appear lighter. On a budget? Before you get too discouraged about not being able to include your dream materials or finishes, know that it is possible to include some high-end pieces while staying on a budget. 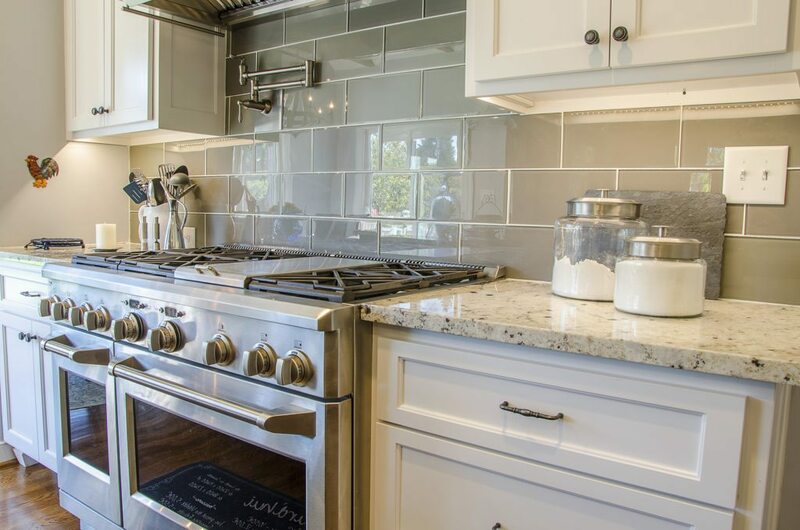 We recommend choosing one or two high-end items, such as tiles for your backsplash or a range-hood that you love. Then, you can use these items as your focal points. Stick to the budget by saving money on your countertops, cabinetry, and other materials. 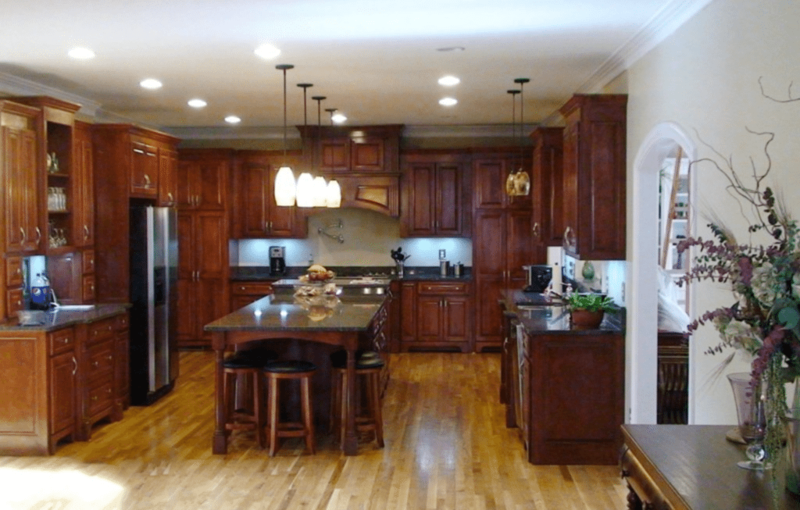 Kitchens are often considered the heart of the home, and the center for entertaining with family and friends. Before you invest in a complete kitchen remodel, it is important to research what you want beforehand. You don’t want to go through an entire remodel to find out that you do not absolutely love your new space. Some important elements to consider when compiling kitchen remodel tips include: layout, cabinetry, countertops, appliances, and finishing touches. We hope that these kitchen remodel tips helped you in planning your dream kitchen. Feel free to contact Balducci Additions and Remodeling to schedule an appointment. Our Mission at Balducci Remodelers is to provide our clientele with the best possible services, material, and craftsmanship in residential land developing, custom home building, additions and remodeling, real estate and electrical services. Our endless pursuit for perfection is our guarantee to you.